Parkinson’s disease (PD) is a neurodegenerative disorder commonly known for its motor symptoms. However, PD also comes with a range of non-motor features like autonomic dysfunction; cognitive impairment; and, in particular, neuropsychiatric symptoms that can be severely disabling (Berg et al. 2014). We present an individual with young-onset idiopathic Parkinson’s disease in whom we diagnosed an autism spectrum disorder (ASD) in adulthood. A triad of deficits in social interaction, communication, and stereotypical repetitive patterns of behavior characterize ASDs (Association PA 2013). A set of symptoms that can also occur as a function of personality changes due to PD. With this case, we will demonstrate overlap in cognitive and behavioral profiles of ASD and PD, how these profiles can enhance each other, and how certain symptoms can look similar but actually are not. A 37-year-old male, with a medical history of young-onset idiopathic Parkinson’s disease, was referred to the outpatient clinic of the psychiatry department because of anxiety. He was diagnosed with Parkinson’s disease at the age of 30, while suffering of progressive symptoms of slowness of movement, with decreased skills of the left hand and festination, since one year. His neurologic examination showed a left-side predominant hypokinetic-rigid syndrome Hoehn and Yahr stadium II. A brain magnetic resonance imaging (MRI) scan, genetic testing, and blood and cerebrospinal fluid analyses did not show any abnormalities. A dopamine transporter (DAT) scan showed decreased bilateral pre-synaptic dopamine uptake in the putamen and nucleus caudatus, more pronounced at the right side, consistent with the diagnosis of idiopathic Parkinson’s disease. Initially, no anti-Parkinson medications were prescribed; however, when the symptoms progressed over the next couple of years, treatment with levodopa/carbidopa and a dopamine agonist was initiated. Seven years later, this individual presented at our outpatient clinic with complaints of progressive anxiety and loneliness. His mother had noticed signs of altered patterns in social contact and problems with keeping relationships and organizing his work. These problems had existed more or less his entire life; however, he experienced a severe increase, after the parkinsonian motor symptoms started. For example, he experienced more difficulty with interpreting his (verbal) work assignments, which resulted in miscommunications between him and his co-workers. He experienced increasing problems with initiating and keeping contacts, resulting in the loss of friends. As a child, he had a delayed language development (formerly assigned as due to several ear infections) and delayed motor development in all domains. During his childhood, he already had problems initiating and keeping social contact, but he had a couple of friends. His mother stated that he did not really share emotions of accomplishments with her or his friends. Also, he developed a strong interest in computers and gaming to an extent of failing his study. Notably, there seemed to be a positive family history on his mother’s side for developmental disorders with one cousin diagnosed with ASD and another with possible attention deficit hyperactivity disorder (no official diagnosis). Therefore, we considered the possibility of an autism spectrum disorder underlying his anxiety and loneliness and initiated an additional diagnostic procedure. Neurologic examination at that point showed a hypokinetic-rigid syndrome and rest tremor more prominent on the left side next to freezing, wearing off symptoms, dystonia in OFF periods, and dyskinesias during ON periods. Psychiatric examination revealed no psychotic symptoms, impulse control problems, or cognitive impairments (Minimal Mental Status Examination 30/30). He showed adequate eye contact, his attitude was friendly but distant, and no emotional connection was established during the interview. His affect was flat, and there was also profound apathy, but he could still enjoy activities. During OFF periods, he experienced anxiety and even panic attacks. He had depressive symptoms due to adjustment issues and a disrupted sleep pattern. He scored 35/50 points on the self-report version of the autism spectrum quotient 50 (AQ-50) (Baron-Cohen et al. 2001; Hoekstra et al. 2008), which is strongly suspect of an autism spectrum disorder. His mother scored him only 24/50 points on the AQ-50, which is on the high end of normal. In a structured interview for autism spectrum disorders, he scored positive on all three domains (deficits in social interaction, communication, and stereotypical repetitive patterns of behavior). According to the structured interview, he mainly presented issues with developing and sustaining relationships with peers, lack of spontaneously sharing enjoyment and other emotions, marked disability to initiate or sustain a conversation, and a restricted interest in computers and gaming. There were also mild impairments in use of body language and social reciprocity, some lack of spontaneous play and initiating activities and a literal approach to language including understanding of jokes. Even though this individual experienced a severe increase of these impairments after the start of the parkinsonian motor symptoms, there was clear evidence for impairments during childhood to make a final diagnosis of an autism spectrum disorder. He followed a course of psycho-education that focused on ASD. He got new insights about his disorder and how to deal with different situations. For example, he learned to explain to people why it is hard for him to initiate and keep contact and to ask for task specifications in clear language at work. Additionally, he was diagnosed with anxiety related to wearing off of the dopaminergic medication, a disrupted sleep pattern, and depressive symptoms due to adjustment issues. Accordingly, he was prescribed the antidepressant mirtazapine at night and was supported by a social worker. This finally resulted in improvement of the mood disorder and better understanding of and coping with the different psychiatric features. In this case report, we presented an individual with comorbidity of an autism spectrum disorder in an individual with young-onset PD. Previously, Starkstein et al. (2015) studied the prevalence of comorbid Parkinsonian motor symptoms in individuals with ASD (Starkstein et al. 2015). They found a higher incidence of parkinsonism amongst individuals with an autism spectrum disorder compared to prevalence studies in the general population. Unfortunately, these results are hard to interpret, as the overall IQ was low, and therefore, several components of the Unified Parkinson’s Disease Rating Scale (UPDRS) could not be performed. The overall low IQ in this sample is probably a reflection of the diagnostic views on ASD in the period these individuals were diagnosed. Additionally, there was a high prevalence of neuroleptics use, which can cause drug-induced parkinsonism and could have raised to prevalence of parkinsonism compared to the general population (Starkstein et al. 2015). With this case, we would like to demonstrate overlapping cognitive, behavioral, and mood features of PD and ASD. Even though these features have never been directly compared, several assumptions are made (Hollander et al. 2009; Langen et al. 2011). First of all, executive dysfunction in individuals with PD can lead to difficulties in cognitive flexibility (Dirnberger and Jahanshahi 2013), which can result in rigid patterns of behavior (Dajani and Uddin 2015). Deficits in theory of mind, which is the ability to understand emotions and intentions of others, are also well-recognized and studied in individuals with PD (Bora et al. 2015). Impaired theory of mind is thought to be one of the underlying causes of deficits in the domain of social interactions and communications in ASD (Baron-Cohen et al. 1985). A higher prevalence of compulsive behavior like excessive hobbyism and punding is well-known in PD (Weintraub et al. 2015). Punding is purposeless stereotype and repetitive behavior seen in individuals with PD, for example, purposeless sorting, cleaning, and assembling objects (Hollander et al. 2009). Punding is thought to be related to the use of dopaminergic therapy (Weintraub et al. 2015). An important core feature in ASD is restricted and repetitive behavior, which can sometimes be similar to the hobbyism and punding seen in PD. This repetitive behavior is also thought to be related to deficits in cognitive flexibility (Dajani and Uddin 2015). In both PD and adults with ASD, the prevalence of depression and anxiety is increased compared to the general population (Skokauskas and Gallagher 2010; Yamanishi et al. 2013). Individuals with young-onset PD, like the individual in our case report, do report higher prevalence of depression and a lower quality of life compared to individuals with late-onset PD (Knipe et al. 2011). The overlap in cognitive and behavioral features of PD and ASD are possible pitfalls that can lead to both under- and overdiagnosing ASD in Parkinson’s disease. Furthermore, motor features of PD like decreased facial expression, reduced blinking rate, and decreased use of body language (Pitcairn et al. 1990) might further complicate the diagnostic process. These features might come across as impaired communication, when in fact they are not. In Parkinson’s disease, deficits in cognitive flexibility and theory of the mind have both been linked to dopamine depletion in the dorsal striato-cortical circuits, secondary to the degeneration of dopaminergic neurons in the substantia nigra (Bora et al. 2015; Robbins and Cools 2014). The neurobiological substrates of ASD are less clear. However, dysfunction of the striatum is also implicated in ASD, especially with respect to cognitive inflexibility (Fuccillo 2016). So even though ASD and PD have different etiologies, they both affect the striato-cortical circuits resulting in similar cognitive deficits. Considering this overlap in cognitive and behavioral domains, a double hit of both domains presumably enhances symptomatology on these domains. In our case, there was an increase in autistic traits and, accordingly, a decrease of function in the domains of cognitive flexibility and theory of mind. In individuals with PD suffering from cognitive and behavioral changes that could fit with both PD and ASD, careful history taking, if necessary, including caregivers/close family members, is of great importance for correct diagnosis; correct treatment; and, finally, for improving quality of life. This case clearly demonstrates the essence of developmental history as a clue to the diagnosis of ASD in addition to the already existing diagnosis of PD. Both populations demonstrate a higher prevalence of depression and anxiety disorders. Correctly identifying and treating co-existing psychiatric disorders may therefore be especially relevant in this population. Whether individuals with PD without ASD, but with cognitive and behavioral traits of ASD could benefit from an ASD approach, should be subject of further research. Fuccillo, M. V. (2016). Striatal circuits as a common node for autism pathophysiology. Frontiers in Neuroscience. https://doi.org/10.3389/fnins.2016.00027. Starkstein, S., Gellar, S., Parlier, M., Payne, L., & Piven, J. (2015). High rates of parkinsonism in adults with autism. 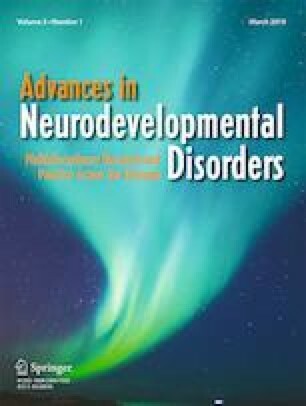 Journal of Neurodevelopmental Disorders. https://doi.org/10.1186/s11689-015-9125-6.